James Herbert MacNair was a furniture designer, painter, metal worker, jewellery designer and graphic artist, who also worked along side Charles Rennie Mackintosh, the sisters Frances (McNair’s wife) and Margaret MacDonald (Mackintosh’s wife); collectively famously known as the “Glasgow Four” (aka by critics as the “Spook School”). His style was close to that of the other members of the group and displayed a highly linear and decorative quality, utilizing typical stylized motifs and the use of the female figure, as can be seen here. In 1888, McNair joined the architectural practice of John Honeyman (later to become Honeyman & Keppie in 1889; the year Charles Rennie Mackintosh joined). 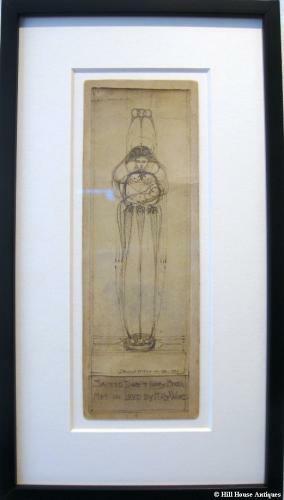 In 1895 he left both the Glasgow School of Art and Honeyman & Keppie, to set up his own independent studio in Glasgow. Another photographic example is held in the Hunterian Art Gallery, University of Glasgow, reference GLAHA 52975. The original pencil sketch was recently sold through Sotheby’s in 2003, previously part of the Collection of the late Thomas Howarth.Very few items by McNair have survived as he destroyed much of his work late in life. This, by repute, also was originally in the collection of Thomas Howarth.